We automatically close the dome if the winds gust near 15 m/s (34 mph) or if sustained winds are at or above 10 m/s (22 mph). Winds are from the South at 27.6 gusting to 33.4 MPH (24 gusting to 29 KT). The pressure is 1007.1 mb and the humidity is 41%. The heat index is 83. Last Updated on Apr 21 2019, 1:53 pm CDT. 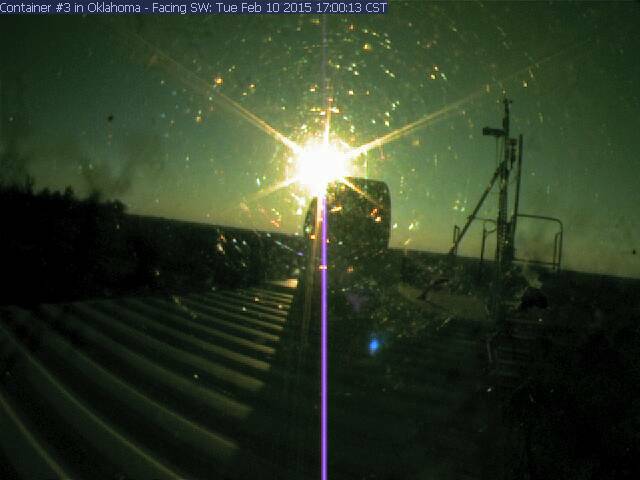 The latest picture of the Oklahoma container (updated hourly during daylight). Hourly pictures from the webcam are archived here. Downloaded from http://www.srh.noaa.gov/oun/?n=events-2011summary, Jan 5, 2012.